When gifted adults or children are dealing with emotional, behavioral psychological or social challenges, it is important to find a place where their unique gifts, talents, strengths and skills will be honored. Anne Tyler offers experience, insights and solutions to integrate the unique needs of gifted individuals and children into treatment. The goal of treatment is to cultivate strengths, teach effective coping skills and instill confidence in each person’s abilities. Resources to understand the special challenges of growing up gifted will be utilized to increase self-awareness and develop a more integrated sense of self. This will support the development of more effective emotional coping skills, communication skills and social intelligence. 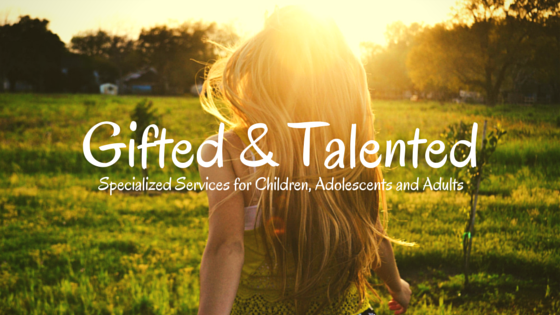 Anne Tyler, MS, LMFT specializes in treating disorders that are co-occurring in the population identified as gifted & talented. The gifted/talented population can be hard to define, since there are many talents and areas of ability to consider. Here are some characteristics of gifted children and important factors to consider when searching for the help they need. Anne provides treatment to gifted children with anxiety and other conditions such as depression, Asperger’s, ADHD, learning disabilities and behavioral disorders. And, she helps individuals, families and children going through difficult life events and transitions and experiencing stressful challenges. These situations and conditions can cause academic under-achievement or failure, behavioral and emotional disruptions at school, family conflicts, social skills deficits, developmental delays and psychological problems. There is a growing body of research about special considerations for the treatment of gifted children that improve the outcomes in therapy when addressed in conjunction with their treatment for their identified conditions. When you have a gifted child, it is important to find professionals that understand their unique needs. Being creative, talented or gifted can bring special challenges. Some gifted individuals go through several episodes of depression or experience chronic anxiety in their lives. Sometimes these problems can lead to serious conditions if left untreated for years. And, unfortunately, many gifted adults are labeled as having problems and deficiencies related to their intensities and sensitivities. The gifted individual may not have heard about these innate traits. Many gifted adults do not realize the range of life challenges that are an integral part of being gifted. Gifted individuals are often given the feedback from others that they are “not normal,” “too sensitive,” “too intense,” or “don’t fit in.” Therapy for conditions can be more effective when taking into considerations the unique challenges and intensities and sensitivities unique to gifted adults. Anne provides coaching for parenting intense & sensitive gifted children. Her approach to parent coaching combines skills based on meeting the unique needs of gifted children, Collaborative Problem-Solving and psycho-educational approaches. It is my intention to provide parents with the skills, the knowledge of special needs of gifted kids and strategies to confidently parent their children. Anne provides life coaching to adults. Life Coaching can inform you of new ways to understand your unique characteristics of being gifted & talented and ways to improve the motivational, social and emotional challenges that are part of being a gifted adult. Click on these links to learn more about Anne Tyler and the Services of Tyler Institute. Anne Tyler is available to speak on a variety of topics for organizations and schools that serve gifted children. She has presentations on executive functioning skill development, unique needs of gifted and talented, neuroscience of learning, dealing with under-achievement and supporting children and teens that have challenges with emotional and behavioral regulation. All presentations are designed to provide applications and tools for parents, educators and/or counselors. Contact Anne for more information. See more on the Events page.